The Yamaha Neo Baritone in gold lacquer marks a new revolution of the traditional british instrument. 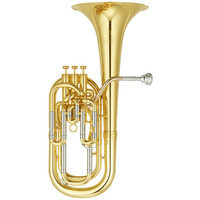 Featuring specifications offer so much clarity power and colour the YBH831S is perfect for the advancing baritone player wanting the best instrument available to them. Also included with this instrument is a hard moulded case and mouthpiece. This entry was posted in Yamaha and tagged Woodwind-Brass-Strings. Bookmark the permalink.